I came across this Kotaku article called "Gintama Manga Isn't Ending Yet Because Its Creator Screwed Up", and I'm not really clear on what's going on. So apparently, Gintama was originally going to end in Weekly Jump on September 15, 2018. But now it seems like it's not ending, and it's moving to Jump Giga instead? What happened there? Could someone explain? Apparently, the author miscalculated in trying to estimate on when the series will end. He mentioned that in Jump, mangaka have to notify the editorial department 6 months in advance before the date that the manga is expected to end. However, he seemed to have realized after informing the editorial department that he could not fit everything he needed for a proper ending in the remaining chapters. 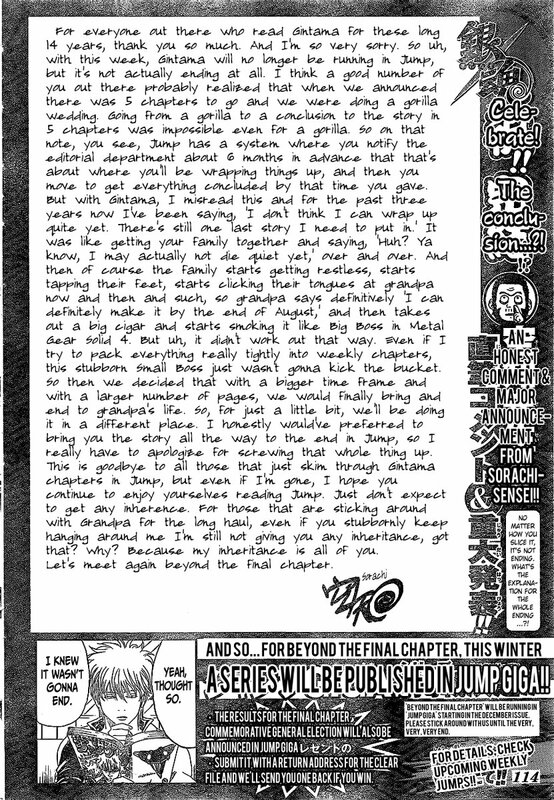 Since informing the editorial department of the projected ending is probably absolute, meaning he can't take back what he said on the predicted date that it will end and there is most likely another manga that was already scheduled to replace Gintama in Weekly Jump since he already informed them that he will end the manga, it was transferred to Jump Giga from Weekly Jump. Is Gintama ending or not? Based on this information, no, it's not yet ending. Not the answer you're looking for? Browse other questions tagged manga-production gintama or ask your own question. Has the Gintama TV series finished airing?